Esperanta klavaro subteno antaŭdiri, swipe tajpadon kaj auto korekto Klavararanĝo estas sama kiel sistemo klavaro, sed havas Esperanton signo butonon kaj datumoj helpi vin tajpi pli rapide. --English-- Esperanto keyboard support predict, swipe typing and auto correction Keyboard layout is same as system keyboard, but have Esperanto sign button and data help you type faster. I find it difficult to use this keyboard due to the swipe feature. You can't turn this off in the app or in Settings. Swipe is especially annoying when you're trying to put a diacritical mark over CGHJS or U. I like that it comes up automatically in Duolingo. The layout is difficult and I can barely type on it without making a ton of mistakes. However it's the best keyboard for Esperanto there is, I believe. I'm going to delete it. I would rather type on the English keyboard. This app has a great layout, and I like it very much. However when typing, it is super slow and rather frustrating. If it weren't for that, I would give it 5 stars. This keyboard is very well laid out and has the basic functions you'd come to expect from any proper keyboard. It's full qwerty layout (common American layout) makes it easy to seamlessly switch between typing English and Esperanto. The added circumflex (^) key is very handy for quick typing, as one only needs to tap it after the appropriate letter in order to apply the circumflex, i.e. c -> ĉ. It is also great for those who dislike using the "x-system" for denoting the circumflex (like me). As necessary as it may be in many other applications, it eliminates the need wholly on iOS. It is light, comfortable (if a little odd to get used to after the default keyboard), and extremely useful when typing Esperanto. Duolingo users take note! 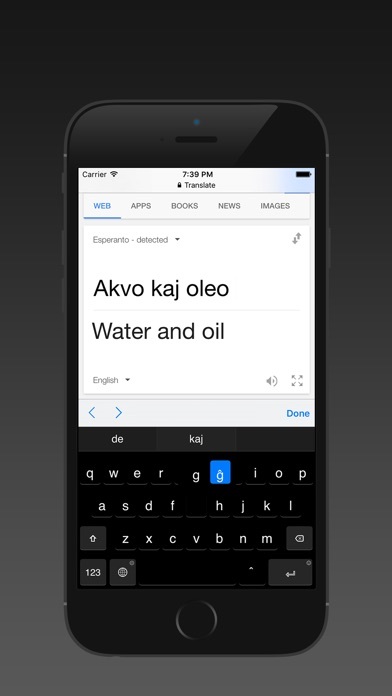 The app will switch between your default and this Esperanto keyboard as needed! Ain't it cool?